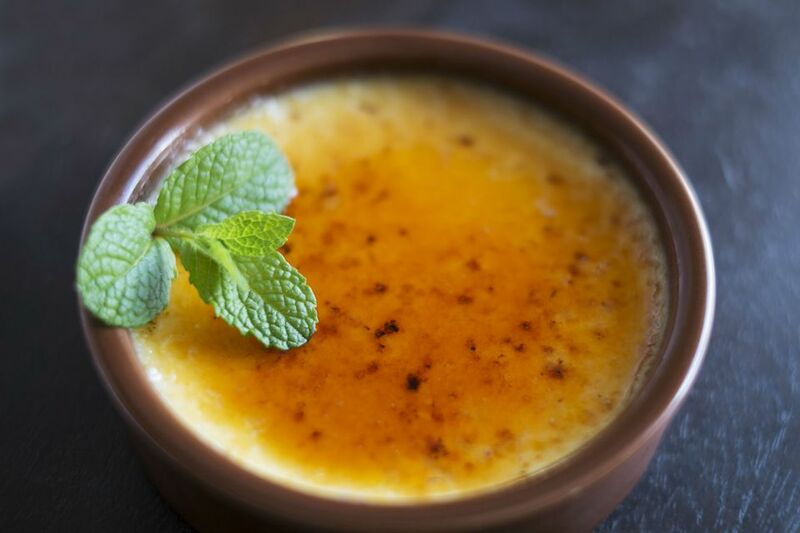 Amaretto liqueur and almond extract give this rich creme brulee its heavenly almond flavor. Garnish this special dessert with some toasted sliced almonds and a few mint leaves. Creme brulee is not only easy to prepare, but it can also be made ahead. This makes it especially convenient for a dinner party or holiday meal when you have several dishes to worry about. Refrigerate the creme brulee overnight and add the burnt sugar topping just before serving. Meanwhile, whisk egg yolks with 1/2 cup granulated sugar. Slowly whisk the hot cream into the egg yolk mixture until well blended, gradually adding the hot liquid so the eggs don't cook.